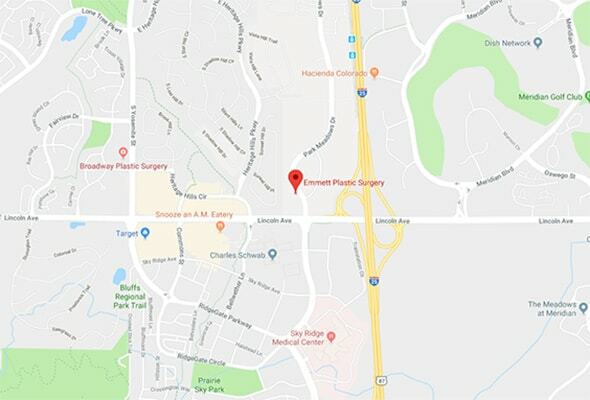 Located in Lone Tree, Emmett Plastic Surgery is a leading provider of advanced plastic surgery and Med Spa services for men and women in the Denver and Centennial area. Dr. Jennifer Emmett is board-certified by the American Board of Surgery and board-certified by the American Board of Plastic Surgery. Dr. Emmett leads a team of highly skilled and experienced medical professionals that values a personalized and compassionate approach to aesthetic treatments and procedures. She is also recognized by the American Institute of Plastic Surgeons as 2015 10 Best Plastic Surgeons for Client Satisfaction. At Emmett Plastic Surgery, we value the trust that you place in us, and we continuously work to exceed your expectations in both results and patient experience. Under the leadership of Dr. Jennifer Emmett, our practice has become one of the leading plastic surgery and MedSpa centers in the Denver area. What sets us apart is the individual attention we give each patient from the first consultation to the time when they see the full results of their plastic surgery and cosmetic treatments. We look forward to welcoming you into our family of patients! Our patient care is what sets us apart from all other plastic surgery practices in the Denver and Centennial area. We tailor each step to ensure that you always feel confident and comfortable with the treatments and plastic surgery procedures you have at our facility. Dr. Emmett and her staff take the time that is necessary to explain the advantages of each procedure and answer all of your questions. Not every person is the best candidate for every procedure, so Dr. Emmett conducts a comprehensive physical examination and learns about your perspective of the treatments that interest you. 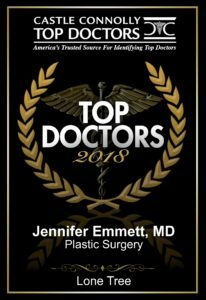 The American Institute of Plastic Surgeons has recognized the exceptional performance of Colorado’s Plastic Surgeon Jennifer Emmett M.D. as 2015 10 Best Plastic Surgeons for Client Satisfaction. Surgeons who are selected to the “10 Best” list must pass American Institute of Plastic Surgeons’ rigorous selection process, which is based on patient and/or peer nominations, thorough research, and American Institute of Plastic Surgeons’ independent evaluation. The American Institute of Plastic Surgeon places the utmost emphasis on selecting surgeons who have achieved significant success in the field of plastic surgery without sacrificing the service and support they provide. Dr. Emmett is a highly experienced and trained surgeon who is double board certified. She is certified by both the American Board of Plastic Surgery as well as the American Board of Surgery. 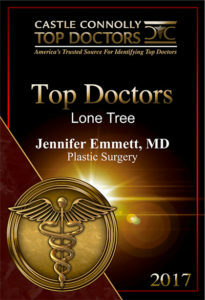 Dr. Emmett has been selected by her peers as a Castle Connolly Top Doctor. This prestigious award is given to the most outstanding physicians in their field. View Castle Connolly here. If you are looking for an experienced board-certified plastic surgeon in the Denver and Centennial area, we invite you to contact us to schedule a personal, complimentary consultation with Dr. Jennifer Emmett. She and the staff of Emmett Plastic Surgery are well-respected amongst our patients. 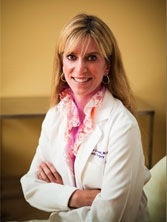 Jennifer Emmett, M.D., 48 years of age, is a highly skilled and experienced plastic surgeon. Having completed her 5-year general surgery residency at the University of Colorado, she is Board Certified by the American Board of Surgery. Dr. Emmett practiced as a breast surgeon for several years before she moved to New York City to receive her plastic surgery training at the world-renown Albert Einstein College of Medicine. While in New York, she was privileged to learn not only the traditional techniques of plastic and reconstructive surgery, but she was at the forefront of cutting-edge technologies in cosmetic surgery. Emmett Plastic Surgery is made up of extraordinary people. Dr. Jennifer Emmett leads a staff of high-level RNs, surgical assistants, and clinical specialists. The overall focus is to ensure that you get the best quality care, in a warm, sincere and welcoming environment.